On this day in 558 an earthquake caused the collapse of the original dome of Hagia Sophia. 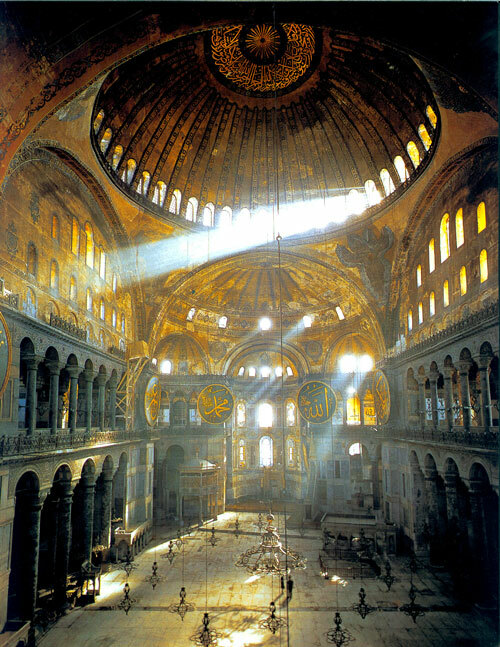 The story of Hagia Sophia is one of the most foolhardy in architectural history. But take heed: foolishness has resulted in some of the greatest achievements ever built. The church was to be the cathedral of Constantinople, the capital of Byzantium under Justinian. A great emperor of a great empire will demand a great church. Against all reason and tradition, Justinian hired Isidorus of Miletus and Anthemius of Tralles, physicist and mathematician respectively, with no experience in building, at all, as the architects. Why such a ridiculous idea? Justinian was crazy, crazy like a fox, and knew if he hired some great master builder, he’d get a very fine, solid, but totally predictable building. And who wants that, especially when you’re modeling your career on the great Christian emperor Constantine, or better yet, want to live up to the model of splendor set down by God himself at the Temple of Solomon? Not Justinian, that’s for certain. So bring on the egghead scientists, men who could imagine geometries that the world had never seen, that no masons’ hands had ever built. The church is singularly full of light and sunshine; you would declare that the place is not lighted by the sun from without, but that the rays are produced within itself, such an abundance of light is poured into this church. An even greater abundance of light was poured into the church, of course, after that audacious vault came tumbling down during the earthquake. Five years later it was replaced with a stronger design, strengthened by ribs and slightly steeper in its profile to stabilize the great saucer. That one was damaged too in a later earthquake, but repaired in the form that it is seen today, a monument to its patron, his outlandish vision, the imagination of the architects who served him, and the masons who–three times and counting–have climbed heavenward to manifest those aspirations in brick and mortar. You are currently reading May 07: if it actually had that golden chain, it wouldn’t keep falling down at Clio’s Calendar: Daily Musings on Architectural History.